Waste Management, Inc. (Houston, TX) has opened a 3.2 megawatt landfill gas-to-energy plant at its 4,500 ton-per-day Lockwood Landfill in northern Nevada. The project, which went online in March, will produce enough electricity to power more than 1,800 homes and offset the use of about 700 railcars' worth of coal. "The Gas-To-Energy Facility at the Lockwood Landfill ensures that not even garbage will go to waste," said Justin Caporusso, Waste Management spokesperson. "By investing in landfill gas-to-energy, we are powering homes using the same waste that is left at the curb." 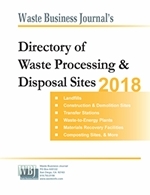 Waste Management already owns or operates 131 landfill gas-to-energy facilities across North America, producing enough electricity to power nearly 475,000 homes. Waste Management creates more green energy than the entire U.S. solar industry. With the nation's need for renewable energy increasing, Waste Management (NYSE: WM) opened northern Nevada's first and only Gas-To-Energy power plant at its Lockwood Landfill, which will use landfill gas produced onsite to generate electricity. The project will create enough renewable energy to power more than 1,800 homes. To commemorate the event, WM hosted a ribbon-cutting ceremony featuring Nevada Governor Brian Sandoval. When organic materials, like food and yard waste, decompose, they create a gas comprised of about 55 percent methane. Collection wells placed all over the site collect this gas and then pipe it to the power plant, where it is used as a fuel to run two generators. The project, which went online in March, will offset the use of about 700 railcars' worth of coal. In total, WM owns or operates 131 landfill gas-to-energy facilities across North America, producing enough electricity to power nearly 475,000 homes. Combined with the company's other renewable energy projects, Waste Management produces over 9 million megawatt hours of electricity per year, or enough for more than 1.1 million homes. Solar energy, according to 2009 trade association data, generates approximately 5 million megawatt hours annually. "The Gas-To-Energy Facility at the Lockwood Landfill ensures that not even garbage will go to waste," said Justin Caporusso, Waste Management spokesperson. "By investing in landfill gas-to-energy, we are powering homes using the same waste that is left at the curb." "Waste Management has been developing landfill gas-to-energy technology for over two decades, and we operate more of these facilities than any other company in the United States," said Paul Pabor, vice president of renewable energy for Waste Management. "As a leader in this industry, we understand how landfills operate and how to use technology to extract the most value from the waste stream." For more information about this and other renewable energy programs, visit www.wm.com. To watch a video on how landfill gas-to-energy works, visit our YouTube page at www.youtube.com/wastemanagement. Waste Management and its 300 Nevada employees provide waste and recycling services to nearly 131,000 customers in northern Nevada. Waste Management, Inc., based in Houston, Texas, is the leading provider of comprehensive waste management services in North America. Through its subsidiaries, the company provides collection, transfer, recycling and resource recovery, and disposal services. It is one of the largest residential recyclers in North America and a leading developer, operator and owner of waste-to-energy and landfill gas-to-energy facilities in the United States. The company's customers include residential, commercial, industrial, and municipal customers throughout North America. 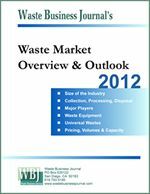 To learn more information about Waste Management visit www.wm.com or www.thinkgreen.com.